Pop quiz: who wrote this: “Our government expects – as do health care providers – that this change will exacerbate the health conditions of patients with chronic conditions and those who are at risk of developing such conditions. In addition, given preventative care is less costly that emergency or acute care treatment, your policy represents a significant download to provinces and especially Ontario, where the vast majority of refugee claimants reside.” If you guessed Ontario Health Minister Deb Matthews, you’d be correct. Matthews’ wrote Federal Citizenship and Immigration Minister Jason Kenney in December over the impact of cuts to the Interim Federal Health Program for refugees. Tomorrow (Wednesday) opponents of the federal cuts will be meeting outside of Deb Matthews’ downtown Toronto office to ask Ontario to have a heart and provide stop-gap coverage for these disenfranchised refugees left without coverage. Demo starts at 11:30 am near Bay and Wellesley Streets in Toronto. Windsor Regional Hospital is closing its long-standing Acute Injuries Rehabilitation and Evaluation Centre after the facility lost $300,000 last year. Once a revenue-generator for the hospital, the centre provides assessment and treatment services to people injured in automobile accidents or on the job. Revenues came from WSIB and other private insurance providers. The hospital claims two other private centres have meant that this insurance work done by the hospital has “dried up.” Curiously Windsor lawyer Suzanne Dajczak told the CBC that the closure would mean costs would shift to the patients. “When you’re injured, you’re under stress, finances generally are cut – in the cases that I see, substantially. They usually come when they’re denied and, yes, they’re going to struggle, and it’s going to be more difficult for injured workers” (Emphasis added). Is Ms. Dajczak suggesting that these private clinics may be less supportive of injured worker claims than the public hospital? Are health services really shifting, or is the health minister being shifty? We can all relax now. All those hospital cuts we’ve witnessed recently – Health Minister Deb Matthews says they are not happening. She says these services are instead being shifted. Evidently we are all fools for not realizing that the 22 beds cut at the Chatham Kent Health Alliance just represent a transfer of services to entities like the Erie-St.Clair Community Care Access Centre, which is itself cutting $8-$10 million after the LHIN refused to allow them to run a $5.2 million deficit. Hamilton Health Sciences says $25 million in cuts are planned and expects 140 jobs will be impacted. Perhaps Ms. Matthews can tell us where these 140 jobs are re-emerging in the Hamilton Niagara Haldimand Brant LHIN? And while she’s at it, where did the LHIN reallocate the 69 beds the Niagara Health System cut in the fall of 2011 and spring of 2012? We can’t seem to find them anywhere. Neither can the hospital, which had to cancel or postpone 758 surgeries due to “bed pressures.” Maybe those beds were needed after all. Perhaps she can tell us where the after-hours clinic, pain clinic, audiology clinic and cardiac rehabilitation program closed by Toronto’s St. Joseph’s Health Centre shifted to? We can’t find them. Can she? The Niagara Health System’s supervisor has commissioned a poll on his interim recommendations for the struggling multi-site hospital. If anything, the poll confirmed why Kevin Smith had been appointed by the province. Pollara conducted a telephone survey in June of at least 75 adult residents in each of the 12 communities served by the hospital. The overall impression rating was 4.5 out of 10 – far below the usual 90 per cent plus approval rating of most Ontario hospitals. 13 per cent described their impression as “very negative.” The worst scores came from Fort Erie and Port Colborne, two communities that have already lost their hospital emergency departments. John Wright folded his arms looking more than a little apprehensive. The CEO of the Canadian Institute for Health Information was about to address a room full of hospital officials, many upset about the Canadian Hospital Reporting Project (CHRP) launched a month earlier. The forum was the May 16 Breakfast with the Chiefs organized by publisher longwoods.com. CHRP was supposed to be the ultimate benchmark, looking at data from 600 hospitals across Canada and involving 100,000 bits of information. Wright said that CIHI had already experienced 80,000 hits on the site, which to some may suggest success, to others a quantification of the damage done to the reputation of their hospital. Staff turnover rates costly to hospitals – will we see them escalate further? How organizations determine the cost of employee turnover can vary. Some look at only the recruitment costs. 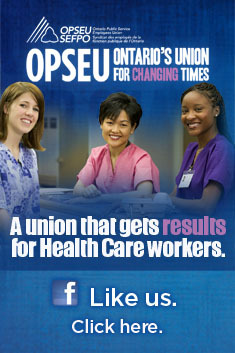 For example, in 2008 HealthForce Ontario estimated it costs $25,000 to recruit a nurse. Others look at broader impacts, including the cost of severance, recruitment, training, overtime and lost productivity. London Health Sciences Centre, for example, estimates the real cost of employee turnover can be as much as 1.5 times the position’s annual compensation. At the Niagara Health System Kevin Smith, the government appointed supervisor, noted in his interim report the difficulty the regional hospital system faces in recruitment and retention, estimating a 5.7 per cent annual rate of turnover to 2019. That turnover is about equally divided between retirees and those who simply decide to resign and seek work elsewhere. That means about 1,750 staff will need to be replaced between 2013-2019. Seventy physicians will also need to be replaced over that period. “There is intense pressure and frankly competition to attract the best and the brightest to any organization and the NHS is currently at a disadvantage,” Smith notes. In Grimsby they must be shaking their heads. They may not be the only ones. On Wednesday 8,000 residents came out in the rain to try to save the $138 million project to build a new West Lincoln Memorial Hospital. The hospital was among six projects that were either cut or scaled back in the spring budget. The day after the massive community rally, Kevin Smith, the province’s appointed supervisor for the Niagara Health System, says the province should close four South Niagara hospitals and replace them with a single regional facility. He is also proposing to close the hospital at Niagara-on-the-Lake, taking the NHS down to just two hospital sites and a stand-alone urgent care centre. The proposed new hospital would replace facilities in Welland, Niagara Falls, Port Colborne and Fort Erie. This is on top of the new $759 million privatized facility intended to consolidate NHS services in St. Catharines. The P3 hospital is expected to open in 2013.